G24 Power is the world leader in DSSC manufacturing. Our proprietary technology has the capability of manufacturing more than 500,000 linear meters of GCell modules per year. Roll-to-roll manufacture is at the heart of our GCell product because of its robust, lightweight, thin and flexible properties. In terms of high speed and high capacity the roll-to-roll web process is similar to inkjet printing. 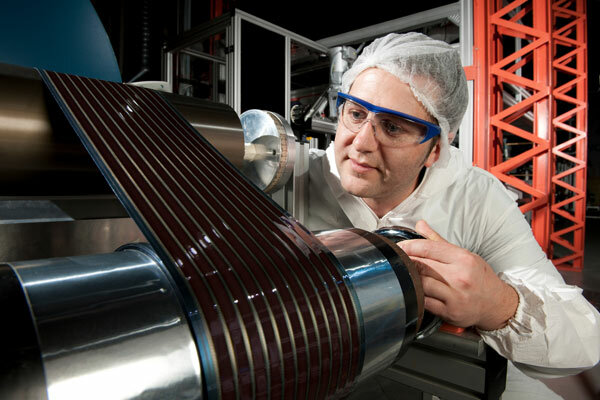 DSSC manufacturing is done using readily available materials that are not toxic.Â GCell doesnâ€™t require high energy processes associated with the manufacture of 1st generation wafer-based PV and makes use of significantly lessÂ vital raw materials used in the manufacture of 2nd generation solar cells. Our culture of continuous improvement enables us to identify cost reduction opportunities for incoming materials, enhancement of GCell product architecture, and more efficient production processes. Initially DSSC manufacturing creates Â rolls of GCell up to 500 metres in length and 150mm wide.Â A secondary DSSC manufacturing process customises and finishes the GCell into a module to suit the size requirements of the customer. We add an interconnect between the GCell module and the product mating printed circuit board (PCB), and finally we encapsulate the GCell module to provide environmental protection. G24 Power offers world-class DSSC manufacturing capabilities including a quality assured, lean, and on-time-in-full delivery performance programme to OEM partners around the globe. Rapid implementation of R&D advances. To view or download a copy of our ISO 9001 Quality Management System accreditation visit Downloads.